So far I’ve gotten a lot of positive feed back on my ‘closer look’ posts. 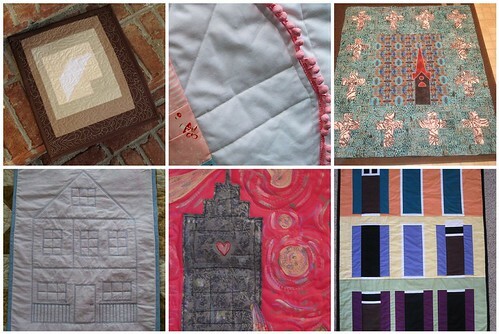 I think this a great way to get the story behind each quilt without feeling so overwhelmed on the flickr group – I mean we did ONLY have 33 entries this past week! Let me know what you think of these closer looks! Should I keep doing them for future challenges? 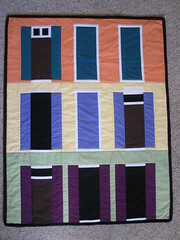 Created in Irmo, SC for Project Quilting Season 3 - Challenge 1 Architectural Elements. I was inspired by this Chapel in Villeaceron www.pleatfarm.com/2010/07/29/chapel-in-villeaceron-by-s-m..., in particular the image of the light coming in the window and how it created varying levels and depths of shadows. So for my mini (sized 13" x 15") I tried to re-create the idea of the window of light and shadows. Once I had it pieced together, I wanted the quilting to play on the idea of light and kind of "sparkle"...and that's where I went completely Andrae (Season 2 of Project Runway) and let the idea with the quilting completely carry me away!...this is also my first attempt at FMQ...and I really love the overall finished product. I pulled all fabric from my stash and scrap pile, spent $2.77 for the quilting thread. I am completely in love with white space! So when I saw the inspiration picture, I was drawn to the left side of it. I also LOVED the part of the carousel that just barely stuck out from behind the building! :) I was going to use lace and then this roll of pompom trim fell out of my trim basket!!! It was a sign...LOL!! I used straight line quilting to quilt it. 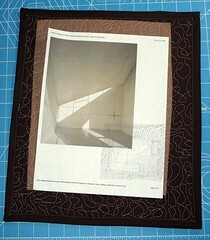 I also used A Walk in the Woods by Aneela Hoey and Kona Pink for the binding. It was made in Texas and is 51"x36.5"! Perfect baby quilt!! When I saw Challenge 1 I immediately thought batiks and church steeples! 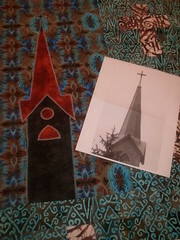 I found a picture of a beautiful steeple and also a log cabin church that had a wonderful cross window and decided to combine the two elements to make this quilt. 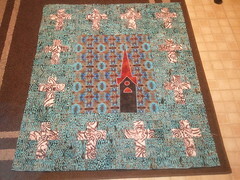 It measures 40" x 48" and has been quilted with angels on the applique background and a feather cross design on the blocks. 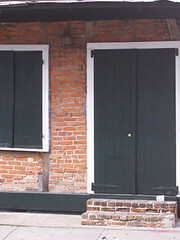 I'm a constant new home window shopper.... always searching for the next best home. 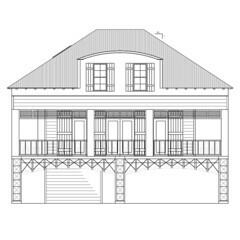 I love looking at the floor plans and drawings available on new home sites, imagining what could be added, detracted, or moved around to suit me and what I perceive as the ideal living conditions. It's only a drawing so it holds infinite possibilities for the end product! 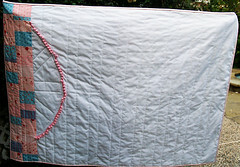 My quilt is a whole cloth, small quilt with a plain white base and only blue stitching. To me, it feels full of promise and is calming to view. I'm re-doing my sewing room and this will hang on the wall after I paint..... this may have helped me decide on the color blue for the walls. 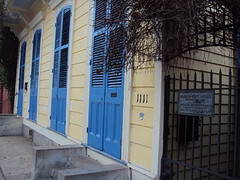 I love the idea of using architecture as an inspiration base. I struggled with not wanting it to be too literal, but still obviously connected to the original idea. This quilt had a very long train of thought (I will be blogging about the process with photos later this evening). The Empire State Building with the heart comes from the movie, "Sleepless in Seattle". 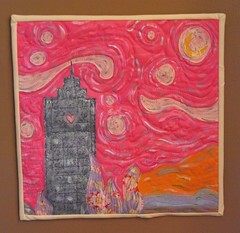 I then moved this icon into a very feminine, lovey version of Van Gogh's "Starry Night". I wanted to have fun with well known icons and shake it up. 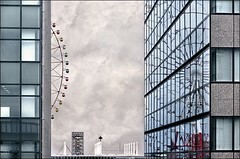 What if Van Gogh had focused on a building in his piece rather than nature? I played with taking a literal representation and a more impressionistic background. 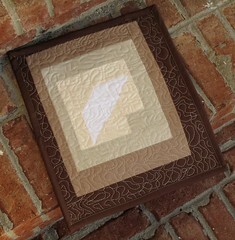 The quilt is raw edge appliqué. I tried a new technique of over saturating the fabric with starch to reduce shredding. There is lots of free motion quilting - I played with using different color bobbin threads to see the results. I also painted all over it in both fabric and acrylic craft paint. I would have love to do more thread painting, but time was an issue. I also would have liked to remove the heart from the building, but as it was the inspiration for it..it felt necessary to keep. I really played with some new ideas here. I really enjoy the love and feminine aspects of this quilt. While I enjoy Van Gogh, it was nice to "lighten" up the mood. The dimensions of this quilt is 30 by 40 inches, and I'm in Pendleton, Oregon. 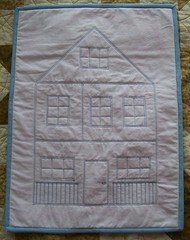 Check out Becky’s blog for more details and how this quilt came to be! These are so cool! I am loving seeing them all.